the mouse was off on another wander - this time to sunny, summery texas -- the calendar might have said it was autumn, but to this northerner, it sure felt like summer! we had a great time; when there's time, perhaps I'll rattle on about some of the highlights of the trip. unfortunately, today's not the day, as it's time to pay the piper and play catch up on all the work and projects that have been neglected. with everything going on this month, september appears to have tied may's record low for blogging - it might be time time to roll out a monthly theme for october if only to help me get back into the groove! along with missing an entire week of posting (and reading others blogs - sorry) I missed my weekly wall wednesday post - even though it's thursday, I'm pretending it's wednesday and putting up a pic of one of the many walls I snapped this past week. the mural above is one of the many 'sanctioned' wall murals encountered in austin. 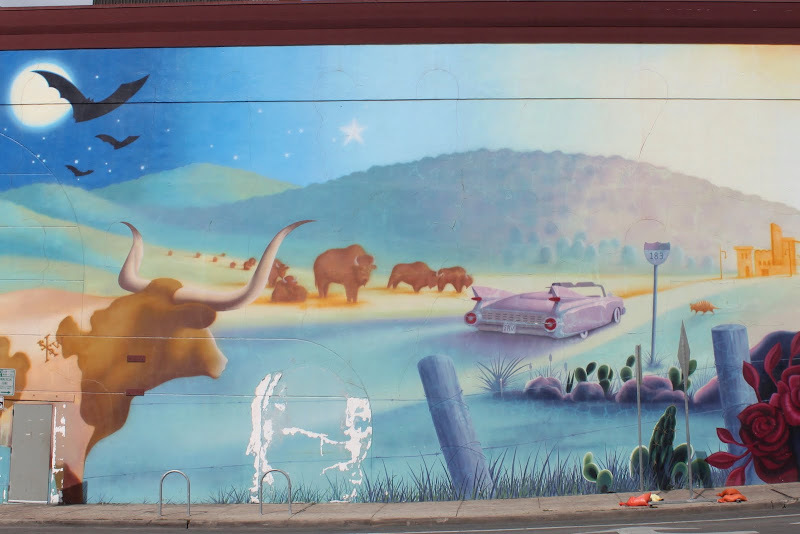 lots of little hidden gems of austin and texas can be found in the mural! carol king singing home again, the song first appeared on her 1971 classic album tapestry. did you know that king's album was in the number one position for a 15 consecutive weeks, which at the time was the longest a female artist topped the chart! Hope it was a good break for you. welcome home from your wander, mouse! beautiful wall photo, and oh, i love carole king! I feel like more people are writing posts but less people are commenting. I'm lagging a bit in the posting dept. Just LOOK at the tail fins on that car! Does that ever bring back memories! Welcome home mouse. Missed you. Welcome back, Kim! It's great to see you back in the bloggerhood. Glad you had a chance to get away for awhile. I enjoyed Carole King's Home very much. Thanks. I love the mural and welcome home, Kim! and it also does for a Thursday Fence picture!